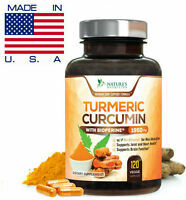 The PERFECT Turmeric Curcumin 1000 mg for Joint Pain Relief, Fast Results! Glucosamine 1500mg+Chondroitin 1200mg+Collagen 300mg- 270 Capsules - Sale!!! !